Information technologies are transforming education, shaping new ways to work in the classroom, new ways of searching information and collaborative learning, which demand new skills. 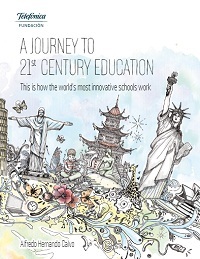 A Journey to the 21st Century Education is a guide for educational innovation explorers in which Alfredo Hernando helps us to discover the most innovative schools in the world. Besides showing new educational methodologies, this book invites the reader to take its own trip to innovation through 80 specific actions.